“CRX is probably an odd choice for a band name, but to me it sums up what our music sounds like.” Strokes guitarist Nick Valensi is explaining the origins of the name for his new side band. The Strokes Bassist on Sessions for New Album: “I Feel Like I’m at Therapy in a Marriage"
Tabs: The Strokes "The Modern Age"
The Strokes Post New Music Video for "Taken For a Fool"
The strokes have posted a new music video for their song "Taken For a Fool." The track comes from their latest album, Angles, which was released earlier this year. 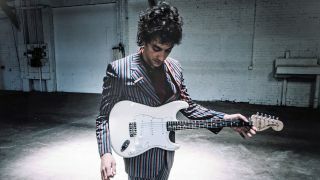 The Guitar World staff picks their 50 favorite studio albums of the first half of 2011. The Strokes to Begin Work on New Album "As Soon As Possible"
In a recent interview with Rolling Stone, The Strokes said that they would like to record the follow-up to this year's Angles "as soon as possible."